The unsteady bearing forces of a propeller can be significantly affected by external transverse excitations. 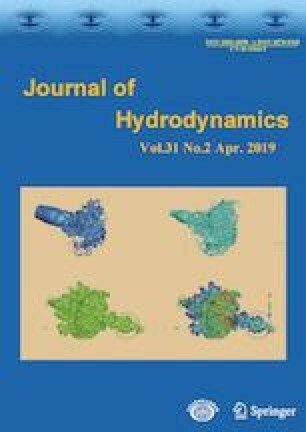 This paper numerically studies the unsteady variation characteristics of the bearing forces of a three-blade conventional propeller with external transverse excitations or without excitations. The dynamic mesh method combined with the RANS turbulence model is employed. The numerical simulation shows the frequency response in the frequency domain of KT, KQ under external transverse excitations. The frequency of the response is found always equal to twice of the excitation frequency. If the amplitude of the external transverse excitation keeps constant, the amplitude of the response increases with the increase of the excitation frequency. If the excitation frequency keeps constant, the amplitude of the response increases with the increase of the excitation amplitude, in a power-law relationship. The pressure distribution can be significantly affected by the external transverse excitation, leading to a high irregularity of the flow field. Project supported by the China Postdoctoral Science Foundation (Grant No. 2017M621455).